Congratulations to Caoimhe Slemon and Aoife McGovern who qualified for the All Ireland Final of the May Fitzgibbon Foursomes competition at the district final in Ballyhaunis on the 2nd April 2016. They final will take place in Greysones Golf Club on Monday July 25th. 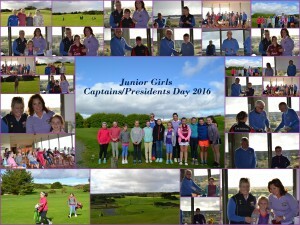 Lady Captain Marian invites all Junior Girls to play for her Captains Prize to Junior Girls on Wednesday 24th June from 12 noon. Food and Presentation of Prizes afterwards in the clubhouse. We hope that your children are enjoying their golf lessons. The first programme of 10 lessons is due to finish at the end of June. We have already had 6 lessons and the dates for the next four lessons are at 5.00pm on: Friday 5th June, 12th June, 19th June and 26th June. The Junior Drive In and Captains Day will take place on Wednesday 24th June and we welcome all our juniors to take part. There will be a stableford competition for the Improvers and a scramble for the Beginners. From the 1st July the Junior Girls will move to Wednesdays. There will be another course of 10 lessons running through the summer with a break for Race week and the week after. To accommodate varying abilities we have divided the group into Beginners and Improvers. This will permit better tuition for each level. We would ask that the all golfers arrive at the club 15 minutes before their lesson ready to golf. Improvers will have their lesson first at 10am and Beginners at 10.30am. We would like if the Improvers played 9 holes after their lesson while the Beginners will take part in a game related to what they have learned. For Improvers, the competition entry fee is €2. The girls will sign into the competition book before play and complete score cards. Ideally we will have 6 cards from each girl to allow them to get an official handicap by September. 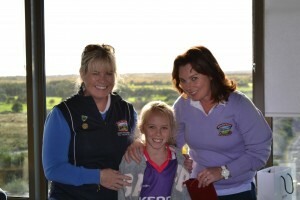 We will track the scores each week and the most improved golfer will be awarded the Junior Cup at the end of the year. 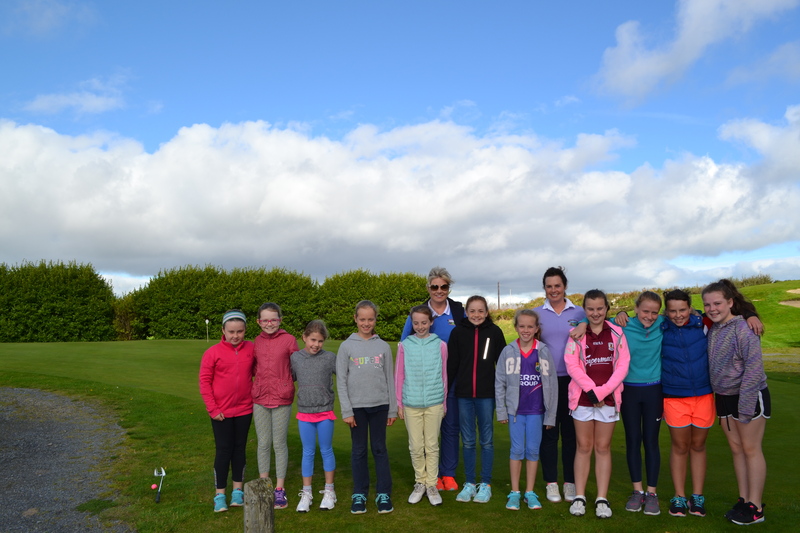 The junior programme is run entirely by volunteers from the Ladies Club, we need parents to help by volunteering to supervise each week. A parent is needed with Geoff at the lesson and we also need people to supervise the Improvers on the course. If you are unable to supervise on your allocated date, please contact another parent to take your place. Your support is vital to make the Junior Programme successful. The junior girls have paid to be members of the Golf Club so we urge parents to bring the girls out on the course with them. This is the only way that they will improve and remain interested in the game and it is a great way to spend some fun time with your child. Golf is weather dependent so if there are poor weather conditions, there will be no lesson. Please contact Cathal on 091 592677 or Geoff 086 818 5732 if you are in doubt as to whether the session is on. 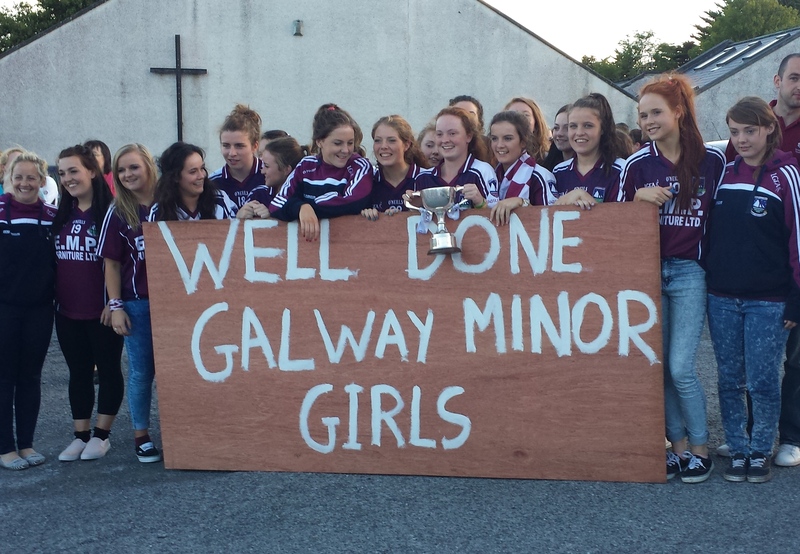 We are delighted to have your daughters in Bearna and thank you for your support. 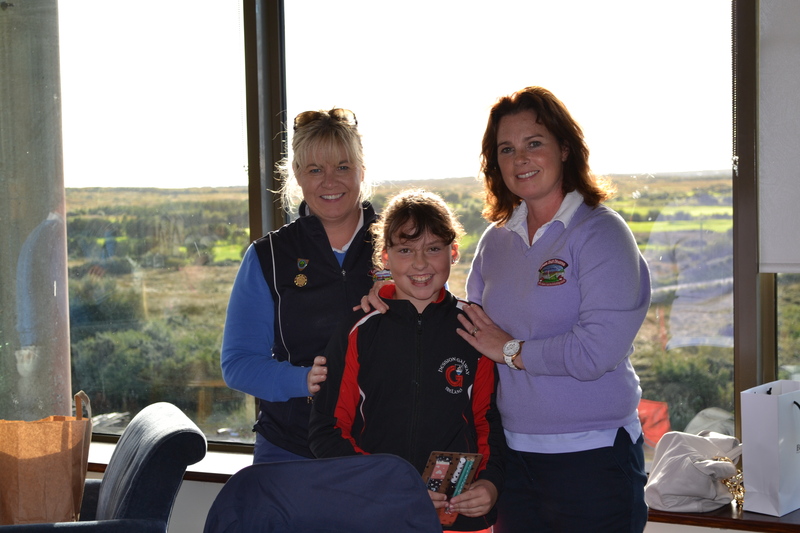 Congratulations to our very talented Junior Girls Captain Ciara Lynagh who has qualified for the National Junior Medal Final which takes place on Wednesday 29th October in Seapoint Golf Club, Termonfeckin, Co. Louth. 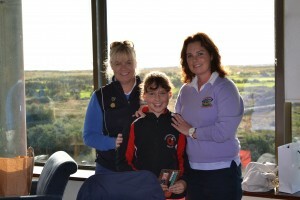 The criteria for qualification was as follows; The 10 juniors who reduced their handicap by the greatest margin in the period March 1 – August 31 qualify automatically and also the 50 players (plus ties) with the lowest aggregate of 3 nett score differentials (relative to CSS), for any stroke or stableford rounds recorded on GolfNet, one in each month June, July and August. 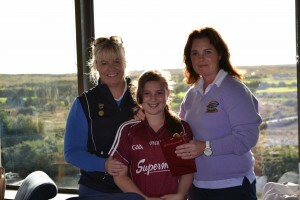 We are very proud of Ciara as she is just one of three girls to qualify from Connacht. Ciara will be accompanied to Seapoint GC by Lady Captain Deirdre and her caddie for the day Aoife McGovern. Best of luck Ciara in the competition. 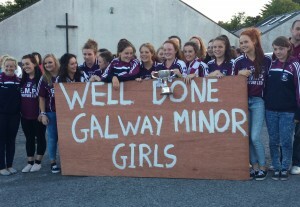 Junior Captain Ciara is an All Ireland Minor Football Champion.. Junior Girls Captain Ciara Lynagh is an All Ireland Gaelic Champion..
Well Done Ciara from all the Junior Girls…. 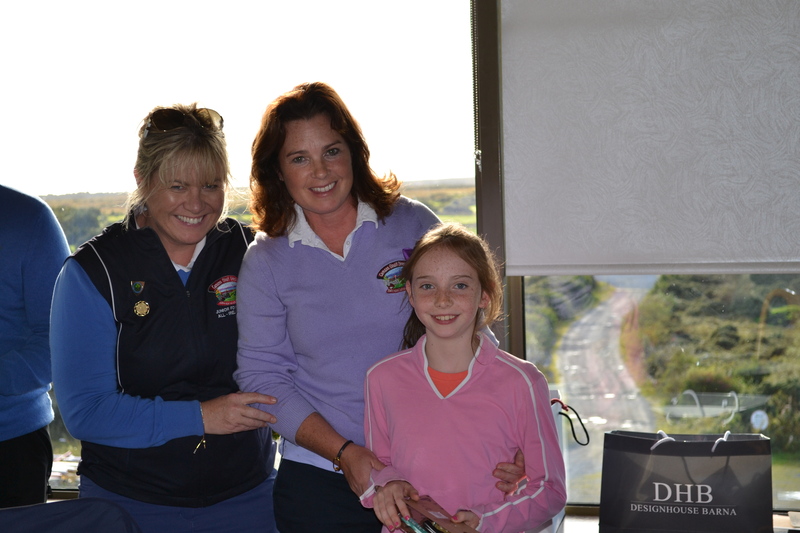 Caoimhe McDermott secures top prize in style! 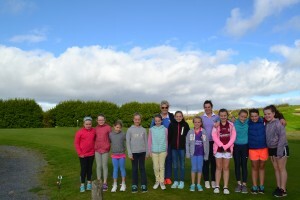 Well done to all the girls who competed for our Lady Captains Prize to junior girls on Wednesday 9th July 2014. 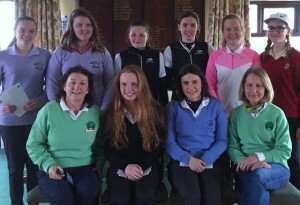 Congratulations to all the prize winners and well done to Caoimhe McDermott who was the clear winner of the Lady Captains Prize to Junior Girls 2014 with a wonderful score of 36 points.